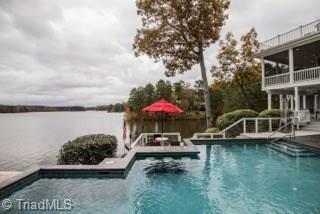 Stunning lakefront home in quiet neighborhood on North Carolina's 2nd largest lake with room for the whole family (and friends too). This truly unique home has all that you could ask for, its open floor plan with breathtaking views from every room will make you feel right at home. Kitchen is completely remodeled with all new, top rated appliances, new cabinets/hardware, lighting fixtures. Quartz and granite countertops throughout all bathrooms and kitchen. All flooring replaced in 2018.